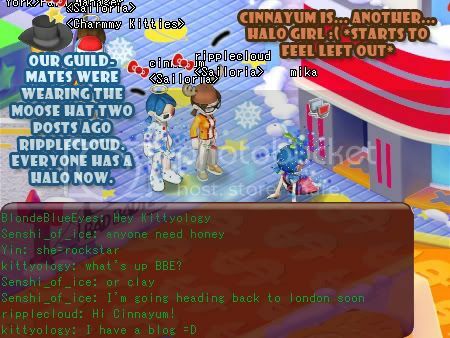 Two posts ago, ripplecloud received a Kitty Hat from the Mad Hatter. And that hat caused a lot of trouble and she was chased everywhere for it. 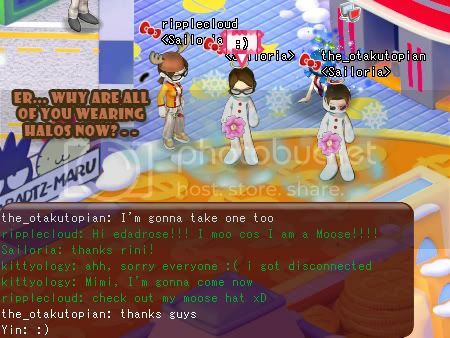 Since then, ripplecloud worked hard so that she could get a new hat - the moose hat! … and even to those who didn’t. 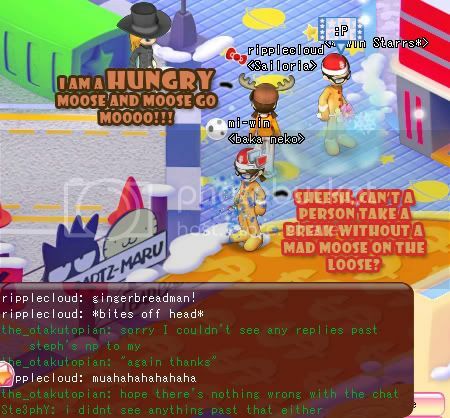 After much ado about nothing about the moose hat, ripplecloud got hungry. 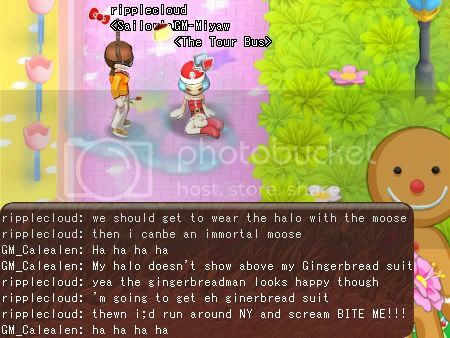 So she bit off Kiui’s gingerbread headgear and chewed on it vigorously. 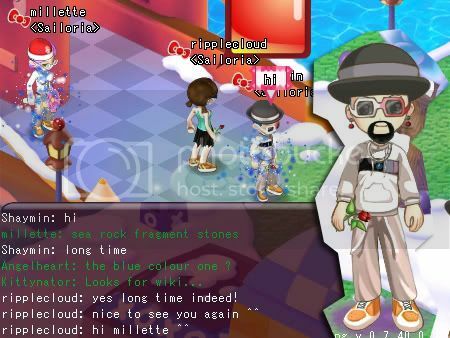 Just then the_otakutopian and Yin came by. 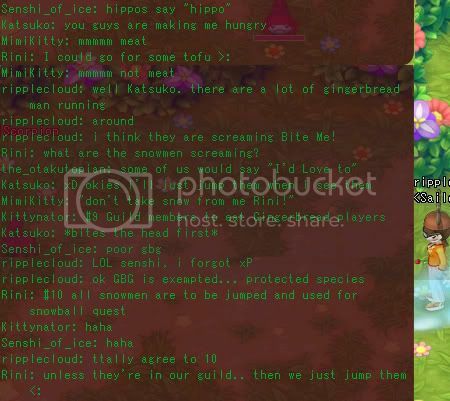 But ripplecloud did not feel moody for long as she soon was distracted by the conversation in the guild chat. 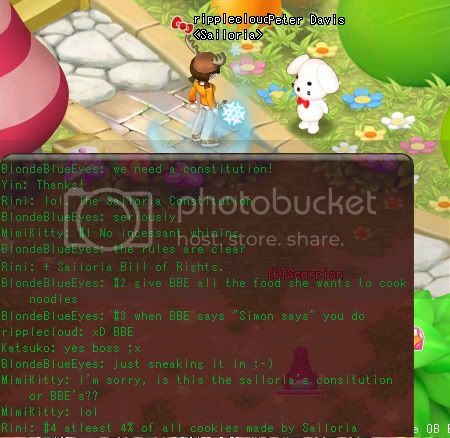 The guild was talking about making a constitution. Well, the most important of the Sailoria Constitution was of course #6! 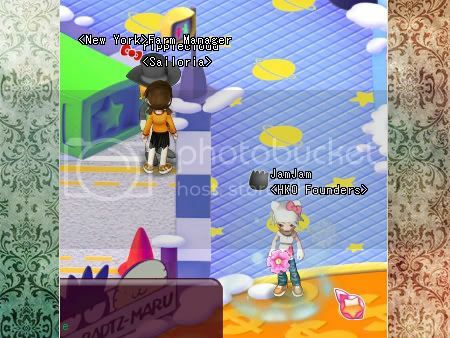 So most of us ended up wearing parts of the gingerbread man suit or the snowman suit, which were one of the quest rewards during the Christmas Reunion. 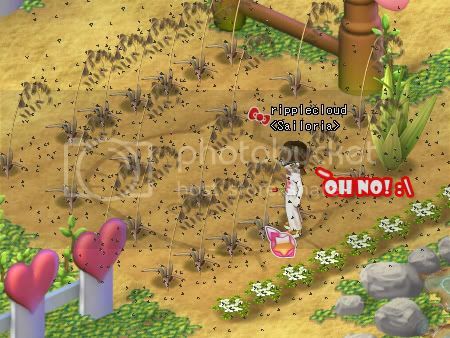 So after a while, ripplecloud couldn’t take it anymore so she returned back to her farm where it was… fly-free! Whoopie! 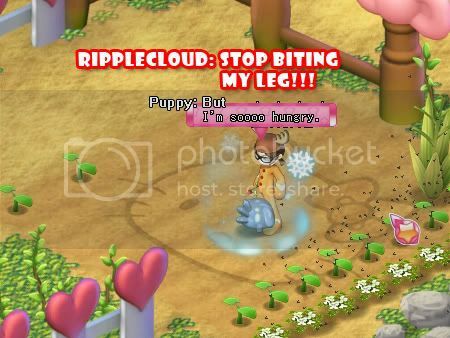 ripple’s hungry puppy went to sulk at the side of the field as ripple nurtured her weird-looking one-arm, beaky snowman seedlings. 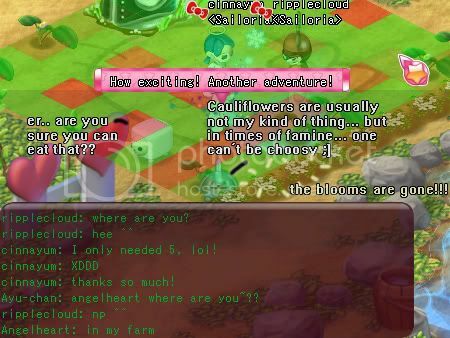 Just then, ripplecloud’s guildmate Cinnayum came visiting with her sheep pet. “Oh good, here’s my chance!” thought puppy, as he gobbled the blooms of the cauliflower plants. And just as the very last cauliflower blooms disappeared into puppy’s gaping maw, puppy farted. And he could hear a threatening rumble in his tummy. “Pain…:(” puppy whined and went to hide until he felt better. 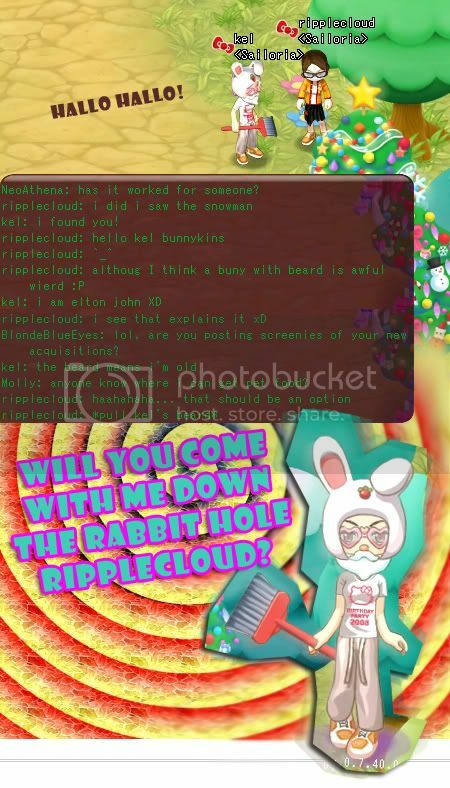 It was the day ripplecloud met the weirdest white rabbit, and the strangest journey began.. Eventually she landed on soft sand. 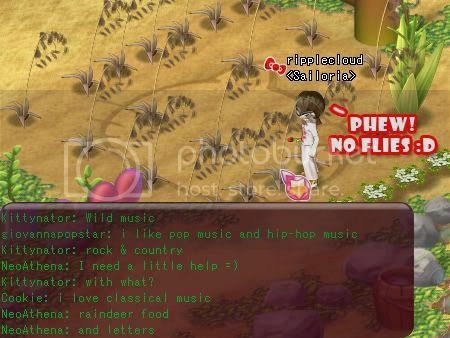 ripplecloud looked around and found that she was on a beach. The white rabbit was nowhere to be seen. Instead, she saw a Duchess, who looked really strong and fierce fussing over a sick black cat. 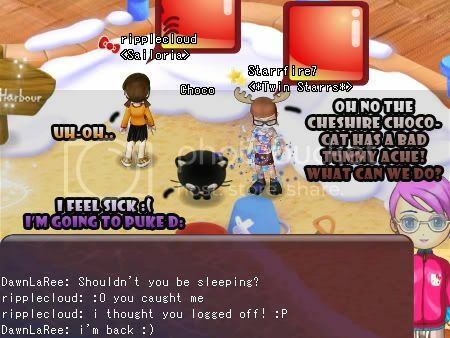 Just as the Cheshire-chococat said that it was going to puke, ripplecloud started edging away. 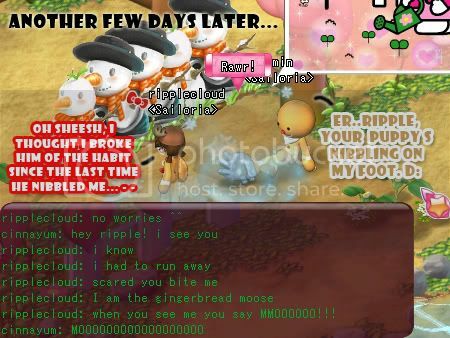 Puke was not a pleasant sight after all :P. ripplecloud did not see the Cheshire-chococat fading away and the Duchess stomping at the fading cat, as she ran away. Presently ripplecloud found that she was in a city full of tall sky-scraping buildings inscribed with the words “XO” all over. 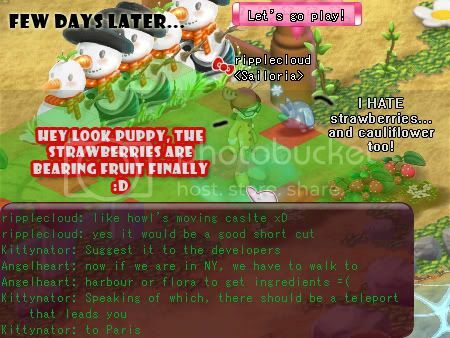 “Curiouser and curioser”, said ripplecloud. At first the city seemed forbidding and empty of people. Then she realised with a start that there was a blonde, blue-eyed girl in green standing alone on the streets. 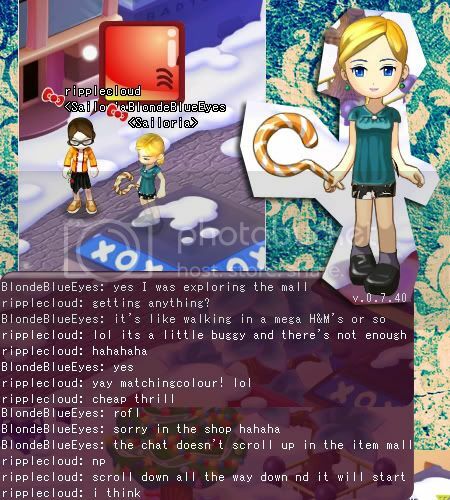 “Hallo”, said the blonde, blue-eyed girl in green. She was a candy elf. 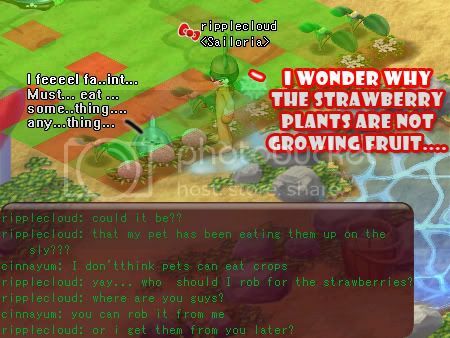 ripplecloud tried talking to her but they didn’t seem to speak each other’s language. 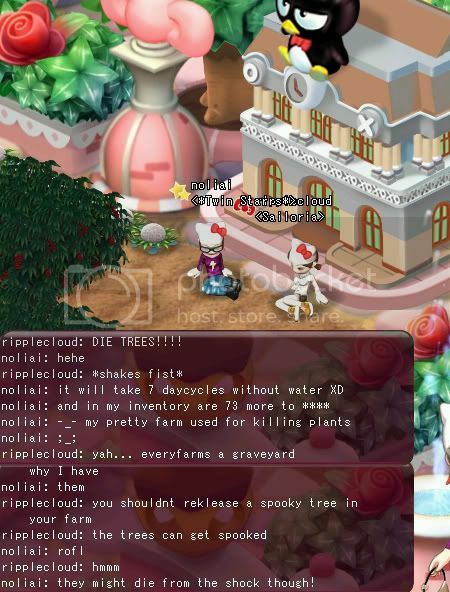 I wish I was an elf too, thought ripplecloud. Then the candy-elf would understand me. 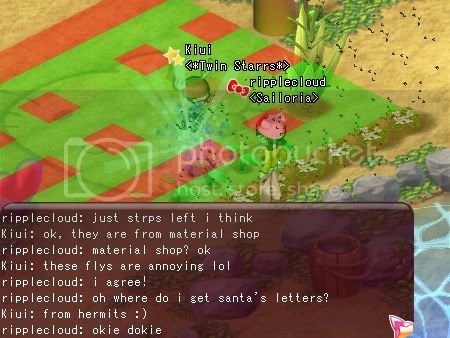 Oopf, deep in thought, ripplecloud walked into a big fat yellow person without realising it. Oh wait, it was not a person but a golden retriever dressed as Santa Claus! 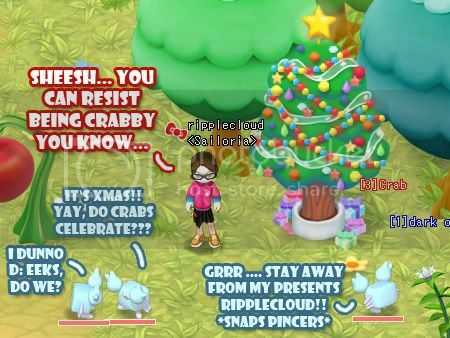 “So ripplecloud, have you been a good girl? 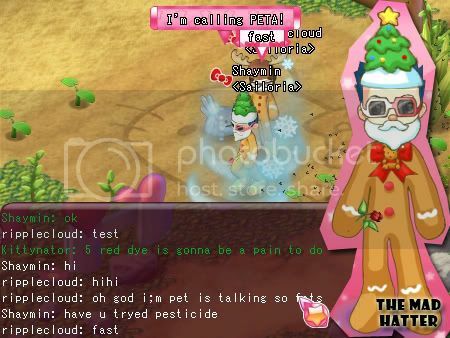 What would you like for Christmas?”, asked Santa Purin Papa. “But which side?” asked ripplecloud. 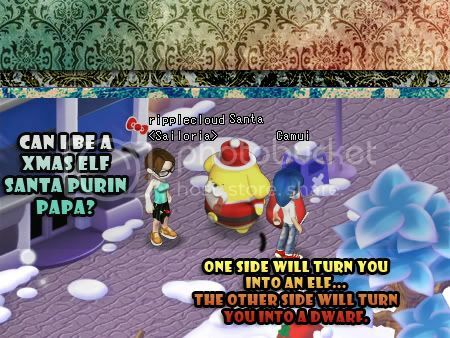 But Santa Purin Papa was already riding away on his sleigh. 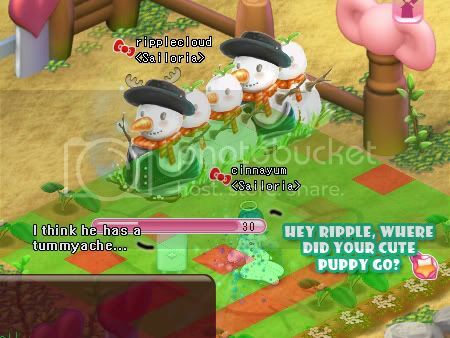 Left on her own, ripplecloud had no choice. She bit into one side of the sadly waving gingerbread man that Santa Purin Papa had given her. Immediately she became short and fat and grumpy. Arghh, went ripplecloud, smelling her new stubby, grimy toes that are now closer to her than ever before. Dwarf toes… she hadn’t know they stink until now. ripplecloud hurried to where the candy elf was, but the candy elf was no longer there. Instead, she finally saw a familiar face. Yggdrasil!! Only, it wasn’t Yggdrasil the harbour salesman… it was a candy-borg that looked like Yggdrasil. The candy-borg showed ripplecloud his heart tattoos on his ankles. He was very proud of them because only minions of the Queen of Hearts get to have them! 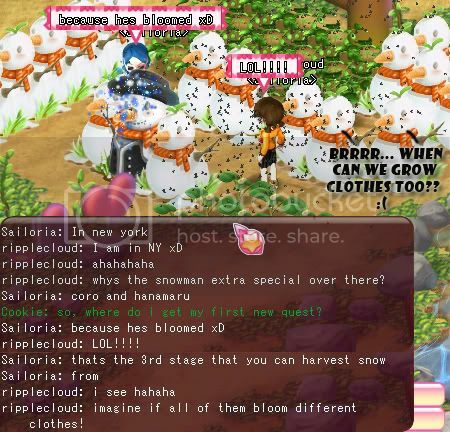 Erm ok, thought ripplecloud. She was getting hungry so she asked the candy-borg where she might find something to eat. “Eh-heh treacle,” said a second softer voice. It was the Mad Hatter and the dormouse out for a walk. 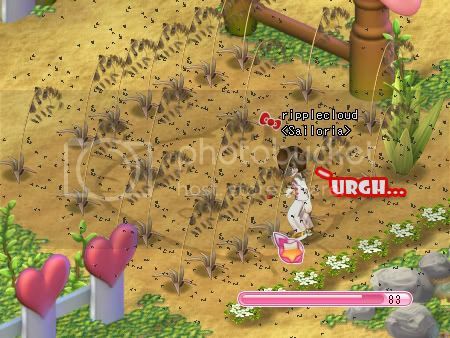 “Wait, can I come too?”, asked ripplecloud as she looked at the two scurrying away. “No room, no room” screamed the Mad Hatter. - 21st entry - Where is Purin? 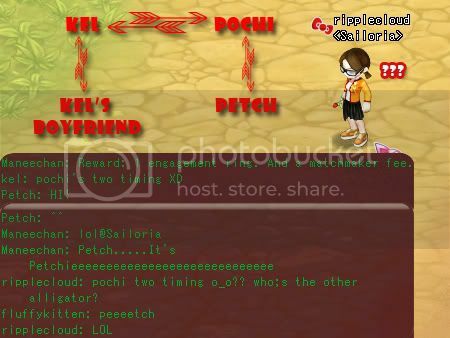 It was the day ripplecloud found Pochi. 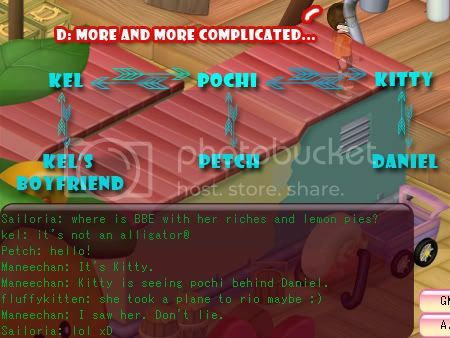 Of course she had to tell her friend “I-want-to-marry-Pochi”-Kel about it. The problem was, Kel already had a boyfriend! 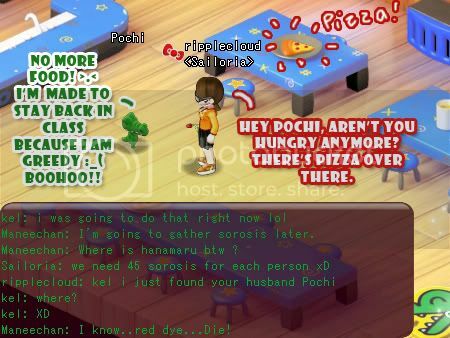 D: …and now Pochi? 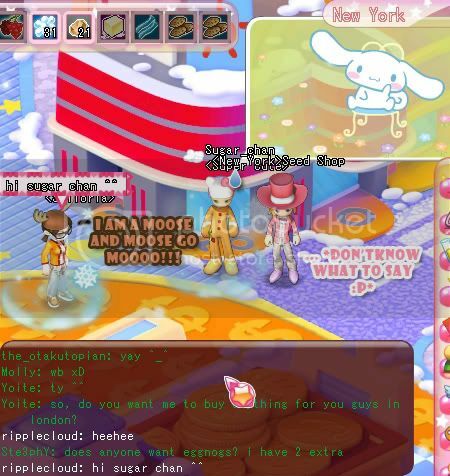 Cinnamoroll told ripplecloud where to go to look help. There was someone by the coast with the talent of making people happy. 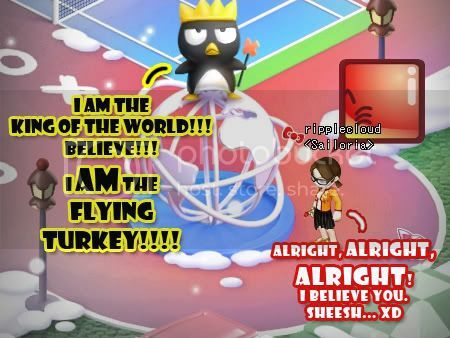 - 46th entry – Where’s the Flying Turkey in New York? - The last thing I saw before the servers closed. 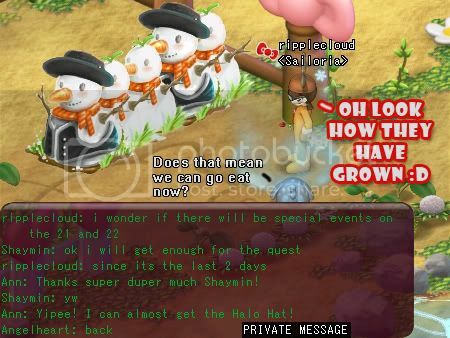 Also: The greatest in-game wedding. Ever! 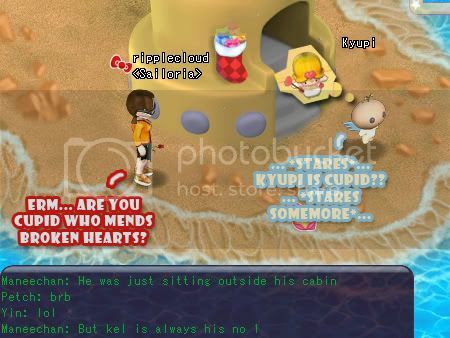 - Happy Hearts Episode 5: Runaway Groom…and A Surprise Elopement?! Hi everyone! It’s me Purin again! 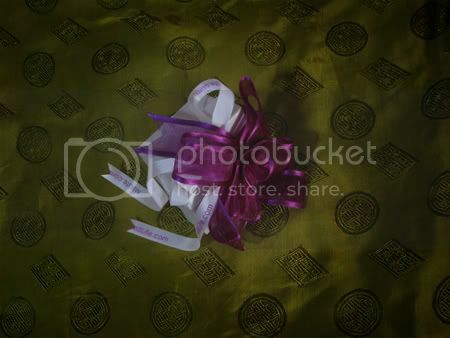 It’s an exciting day today because it is my birthday day :D Yup that’s today 16 April! Purin Papa was in the kitchen too. I told him about the present that ripplecloud received in the mail and how Muffin, Scone and I wish we had a pendant like that too. 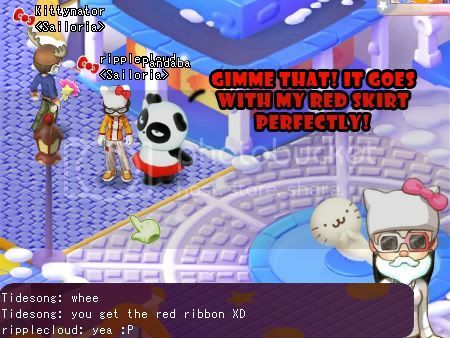 Do you know, the SanrioTown blog says Papa is known for telling corny jokes. But honestly, I think Papa’s jokes are more smokey than corny. Because it is my birthday, Scone and Muffin came over extra early to play. We had lots of fun jumping on the cushions. :P And Muffin showed us his neat trick of balancing a four-leaf clover on the tip of his nose. The clover is his birthday present to me but I am not good at balancing stuff on my nose :P.
“Make a wish” said Purin Mama. “Cut the cake! Cut the cake” chirped Scone and Muffin, their whiskers twitching. It was a lovely cake *nom nom nom* It was funny to see Scone and Muffin stuffing themselves with cake at top speed until their cheeks are puffy xD. “Slow down Muffin and Scone” said Purin Mama worriedly. 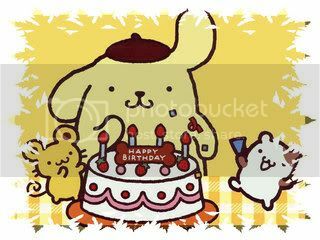 And all too soon the cake was gone *cries* Purin Mama should bake an even bigger cake next time! 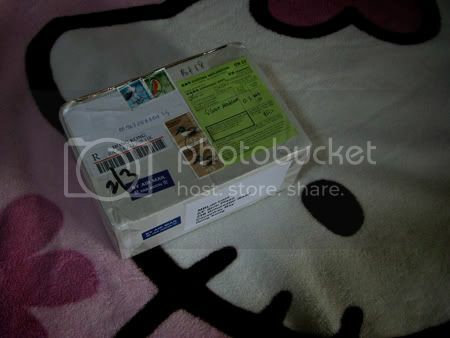 “Oh by the way a present came for you in the mail” said Purin Papa. o_o A present in the mail for me??? Is it… a letter P diamond pendant??? *Not actual size. It’s actually smaller, about the size of a fingernail. 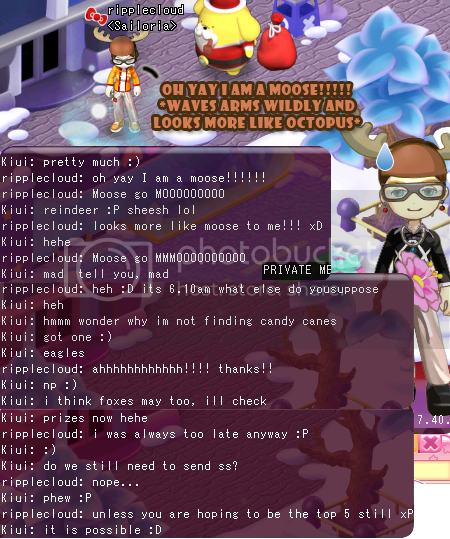 Thanks GMs for picking me ^____^ (I think it’s for this video.) 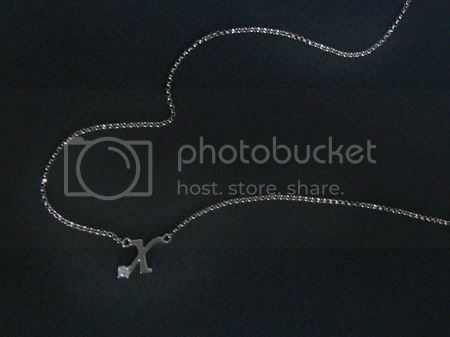 It’s a really cute pendant. 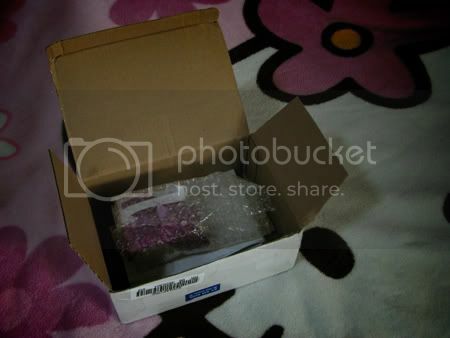 - Ripplecloud’s HKO trailer prize package, safely landed. If I weren’t a puppy, I’d probably be a sugarbunny because I have long ears too! Heehee. 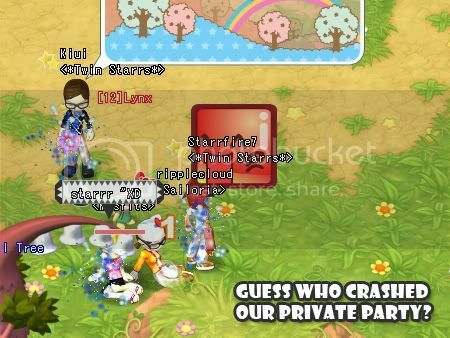 Hi everyone, it’s me Purin! March just flew by and Purin has been a very good puppy. I’ve been going to school and doing some of my homework •ω• because Purin Mama says I can’t go out to play if I don’t do my homework. -ω- ! I’m sorry I’m not posting more to this blog but nothing much has been happening and school is boringggggg… but I hope you like the new blog design ^ω^ I wasn’t sure about orange at first but ripplecloud and I sort of got used to it after a while. Anyway the only exciting thing that happened last month was a “reporter” called Cyndle who visited our cafe and interviewed Purin Papa and Purin Mam. 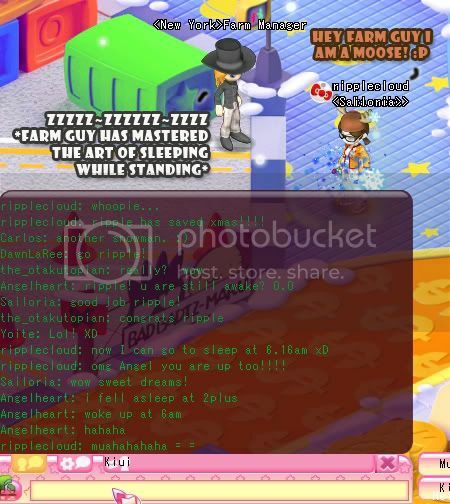 She said she was writing fake news about HKO o_o That confused poor Purin, that’s me! How can news be fake? 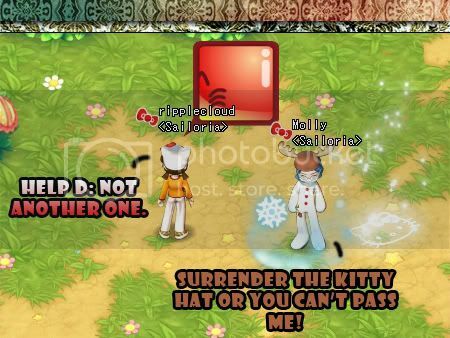 Should Purin Papa and Purin Mama lie to make the news fake? I don’t understand! 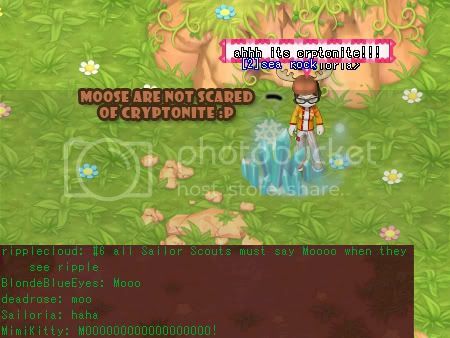 D: So, it is lucky Cyndle didn’t interview me because I wouldn’t know what to say. I’m sure I am a very good puppy to interview if she wants to know about pudding :P. But guess what! I appeared in the news she was writing anyway, even though she didn’t interview me. Look! Here’s Muffin and Scone and I showing off our acorns in the picture that comes with the news! Don’t Scone and Muffin look silly with their mouths stuffed with acorns? They just can’t resist them even if the acorns are supposed to be for paying customers *micmics Purin Mama* :P Mama Purin and Papa Purin can be pretty vexed by them sometimes. But we are rolling in acorns anyway since there are way less customers nowadays. Eeks, there’s Purin Mama again! I must go do my homework now or there will be no pudding for supper *gulp*. Bye bye! - Cyndle: How does Purin’s Coffee survive these economic downtimes? 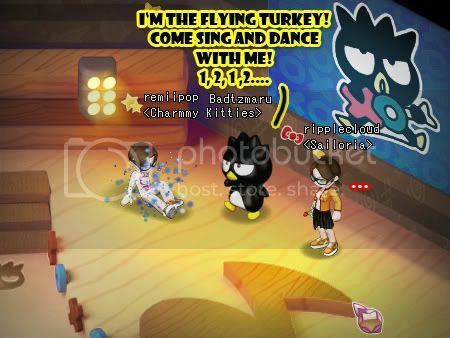 46th entry – Where’s the Flying Turkey in New York? 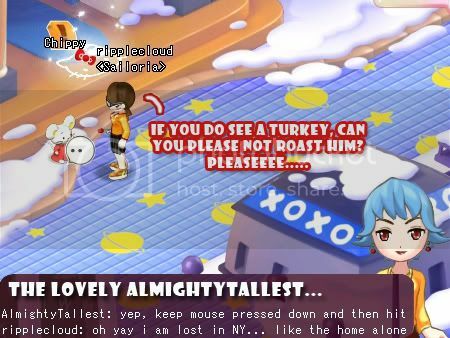 Here’s AlmightyTallest and I on my first day in Christmas Land, HKO. 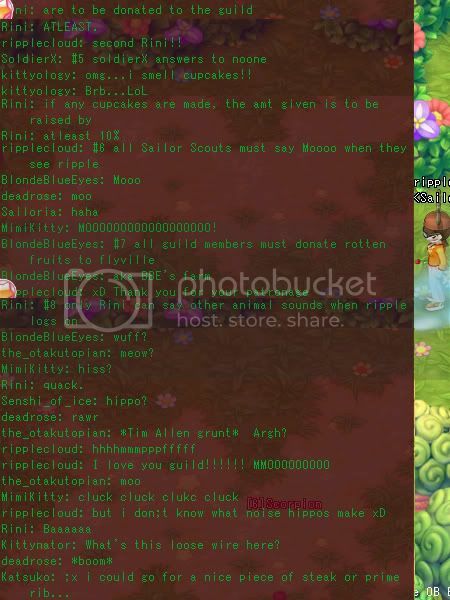 And of course the ever bubbly Sailoria guild in the guild chat ;). 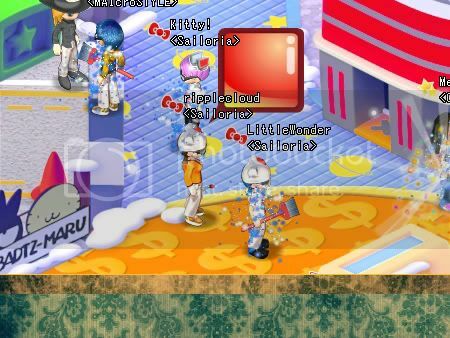 Here we go again, where ripplecloud last left off in Founders’ Beta – right here somewhere in Sanrio Harbour. 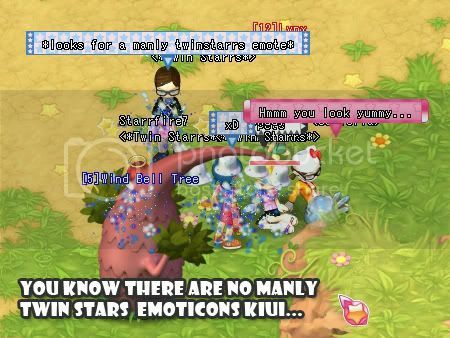 Except that Sanrio Harbour feels… different. 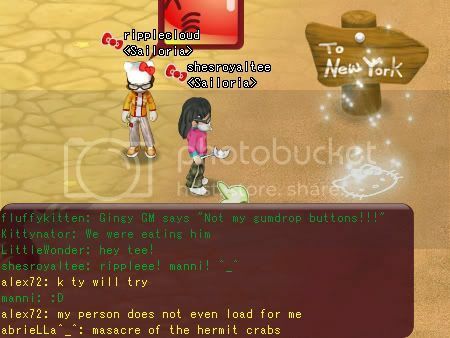 In New York, ripplecloud met Chippy. 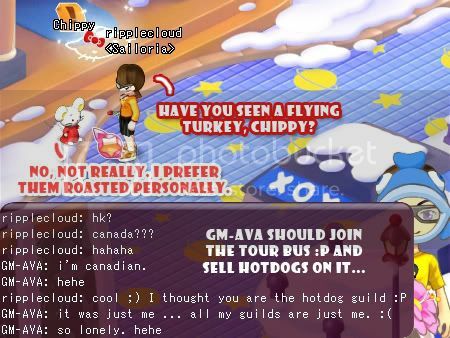 ripplecloud first met GM-AVA when he was in the hotdog guild. Tsunko, who was standing by the Grand Central Station, had not seen a flying turkey either. 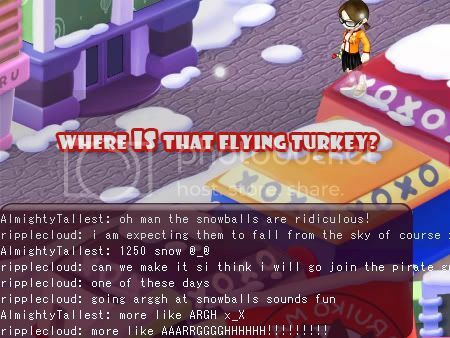 ripplecloud continued looking for the flying turkey in New York. And what do you know, she had to bump into Badtz at the Lincoln Center. 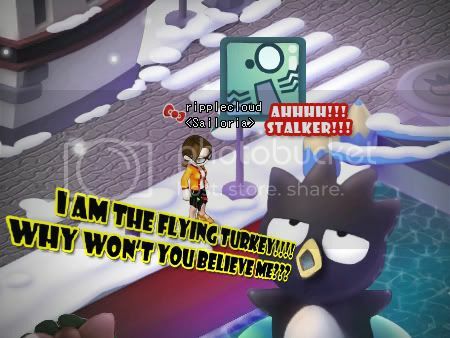 No Badtz, you are not the flying turkey. Here’s Badtz outside the Arthur Ashe Stadium. 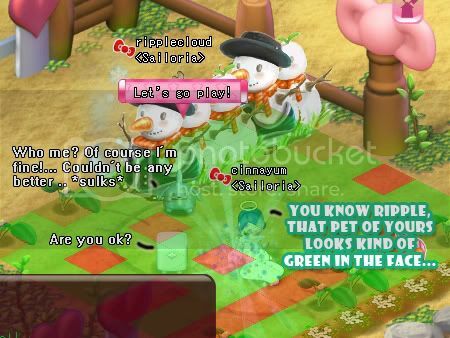 Honestly, sometimes you just gotta let some penguins get their way as long as it doesn’t hurt you. 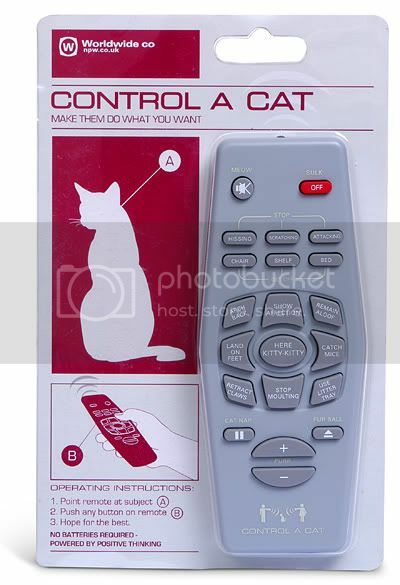 New York is one city with serious Badtz obssession issues. 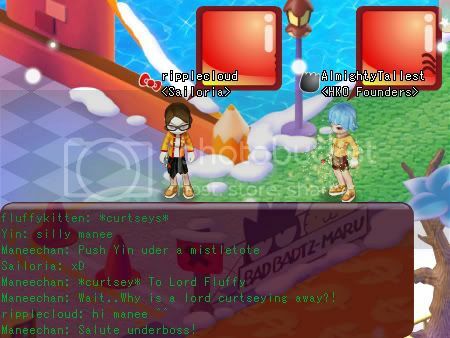 Unfortunately, ripplecloud doesn’t take orders from Badtz billboards, nope! 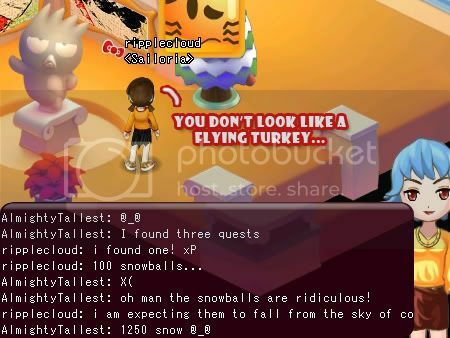 So where was that flying turkey anyway? 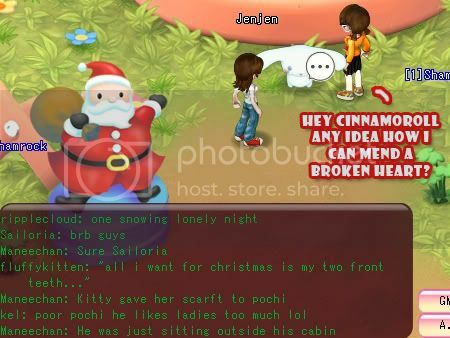 I totally missed Noliai during the Xmas Reunion! 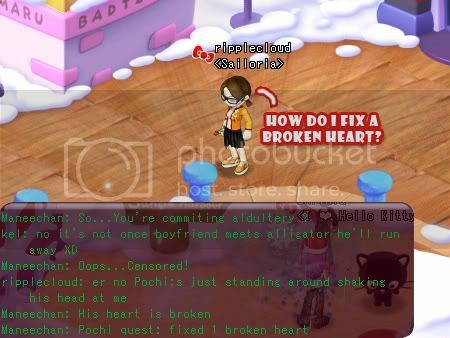 Happily, she was back for Happy Hearts. 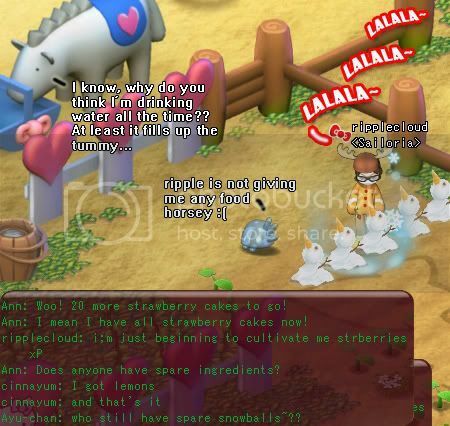 So I spent some time on her farm with her. 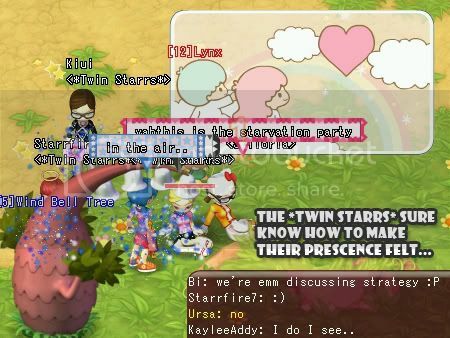 But those *Twin Starrs* just wouldn’t leave them alone :P Here comes the leader and her stalwart member recruited during Founders’ Beta. 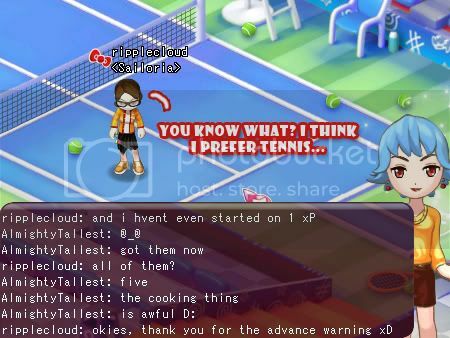 I guess the male players themselves are just as confused too! xD Muahahahahaha!